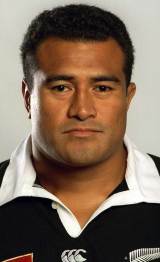 Samoan born Olo Brown was an automatic selection under the watchful eye of All Blacks coaches Laurie Mains (1992-95) and John Hart (1996-98). He came into rugby despite being a chartered accountant outside of the game. In 1989 Brown was first-choice for Auckland - ousting Peter Fatialofa in the process - and alongside Sean Fitzpatrick and Steve McDowell - and then Craig Dowd - he was an integral part of the front-row which replicated their club form for the All Blacks. He earned his debut for the national side in 1990 when he was summoned for a midweek match in France but he had to wait a further two years for his first Test cap which came against Ireland. He only missed one game for the All Blacks in the next six years - a match against Japan in the 1995 World Cup - and took part in the historic win in South Africa in 1996 and the first three seasons of Super Rugby with the Blues. In 1998, Brown's career came to a sudden halt when he injured his neck and back in the Tri-Nations Test in South Africa. He was replaced by Kees Meeuws and although Brown never retired - he shied away from the media glare engulfing the sport - he never recovered from the injury. Brown earned the prestigious honour of being the first All Blacks prop to reach 50 Tests and when his career came to an abrupt halt he was on the 56-cap mark. Brown has since taken up a career as a lawyer.